"We focus on displays, using everyday things in unusual ways," says owner Megan Eatock. There's nothing junky about JUNK on Fourth Street. The displays are ahh-dorable from floor-to-ceiling with stuff for your home or workspace, indoors and out, even clothing. It's 7,200 square feet of good-smelling space (no musty odor here!) packed full with JUNK's 30 vendor booths, including Coeur d'Alene Longboards, Westside Salvage, True Love Furniture, Homewreckers and a new clothing spot, Le Bear Boutique. When people come in, they get inspired, says Megan Eatock, who took over the shop with her fiancée, Matt Bright, in January 2017. 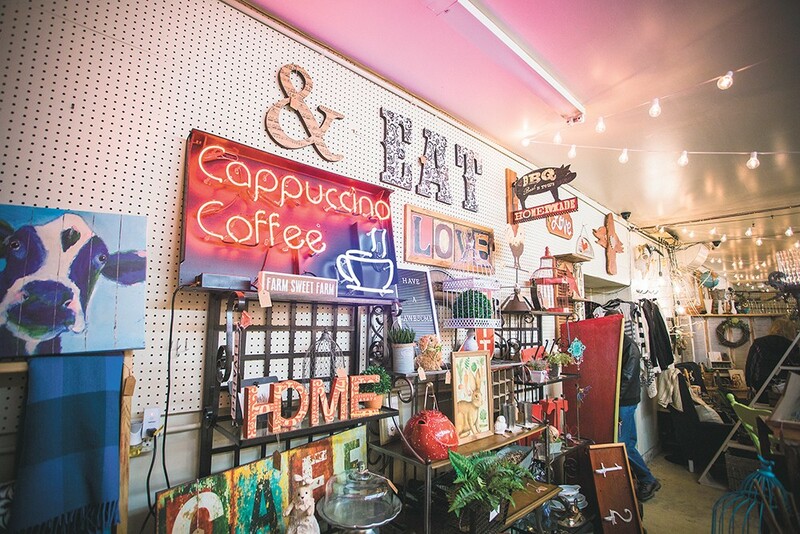 The prior owner had created JUNK from another vintage shop, Fray, which was located across from JUNK's current location and is part of a corridor of thrift, secondhand and vintage shops along Coeur d'Alene's midtown area. "We focus on displays, using everyday things in unusual ways," says Eatock. This includes old window frames as mirrors, an urn as a flower vase or lamp, a piece of luggage as a side table. Shabby chic décor sits alongside farm-themed stuff, old tools, signage with inspirational or pithy sayings, dolls, books and plenty of intriguing, unusual finds. And, she adds, because the vendors have a good time with the displays, so do shoppers. Eatock tries to move the displays around a lot to keep the look fresh — current trends include cow-themed artwork and objects, as well as a section of plaid items — and she's on hand to mentor other vendors as needed. She says she got into refinishing furniture about six years ago and will be adding classes in a downstairs workspace to help teach others to do the same. There is also a display of DIY-brand paint, like the kind you can use to turn any surface into a chalkboard. Eatock doesn't spend near as much time as she used to thrifting or going to estate sales, she says. Because she and Bright are remodeling, she says, they don't have room for more of what shows up, which she laughingly admits is a good thing. "Otherwise I'd buy way more," she says. The original print version of this article was headlined "JUNK"